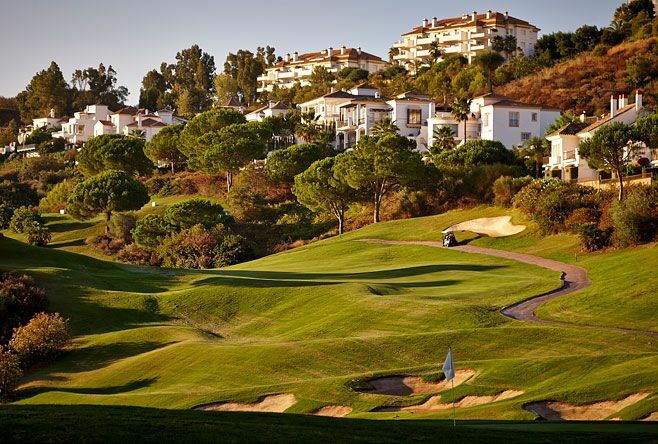 La Cala Resort is the largest golf complex on the Costa del Sol featuring a luxury hotel, 3 championship golf courses, a 6-hole Par 3-course and La Cala Golf Academy. La Cala Resort’s extensive sports and leisure facilities include floodlit tennis courts, squash court and fitness centre and a FIFA approved football pitch. 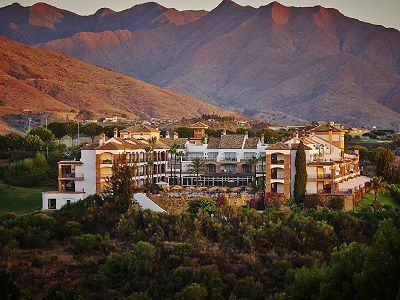 The resort is located just 5km from the coast with a resort shuttle during the summer to Cala de Mijas. For dining at the resort the Clubhouse offers both fine dining and casual meals throughout the day. Enjoy al fresco dining at La Terraza Restaurant serving a range of haute cuisine. La Bodega Restaurant offers authentic tapas accompanied by superb wines chosen from across Spain. Half Board upgrades offers 4 days Half Board for the price of 3! La Cala is within 25 minutes away from the vibrant Marbella and just 10 minutes from Fuengirola offering extensive restaurants and nightlife. Malaga Airport is situated just 30 minutes from La Cala Resort with transfers available on request. Ascot Golf Packages at La Cala offer 1 in 8 Free, with shared golf buggies included as standard for all guests. 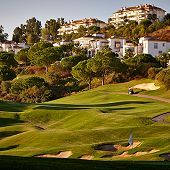 Groups of 8+ receive Free Hotel & Golf for the Group Leader at La Cala Resort. Offer Conditions: Group Offer cannot be combined with any other offer or discount. Listed Package Prices: Listed Golf Package prices apply with Free Hotel & Golf for Group Leader. Listed Golf Package prices at La Cala inlude Standard Room, Daily Breakfast, Golf, Golf Buggy & Spa. Listed Package Prices: Listed Golf package prices apply for Offer dates with FREE Half Board for 7 Night stays. Enjoy a fantastic PGA Pro Golf week at La Cala Resort, Spain. - Pro plays and stays FREE of charge with at least 6 paying golfers. Offer Conditions: Evening dinner includes choice of Starter, Main Course & Dessert from La Terraza Restaurant menu. Classic Rooms (25m²) at La Cala Resort are authentically styled with an Andalucian touch. Warm, rich colours combine with classic Spanish airiness, reflecting the wide open spaces of La Cala Resort. Beautifully appointed to a high standard, your room positively urges you to stretch out, slow down and savour the easy-going Mediterranean lifestyle. Superior Rooms (33m²) at la Cala Resort are decorated in Andalucian style with warm, rich colours. Each has a large balcony or terrace, promising far-reaching views of the fascinating landscape that surrounds La Cala Hotel, and enticing opportunities for an alfresco breakfast or hedonistic sun worshipping. Junior Suites (40m²), feature two separate areas: salon and bedroom. Adjoining the comfortable salon, the open plan kitchen lets you enjoy a conversation with your family or friends, perhaps while preparing a classic Spanish snack from local ingredients. La Terraza Restaurant As its name implies, at Terraza you can dine on the terrace with its poolside and patio views, or in the elegant dining room. An enticing range of haute cuisine dishes are served each evening, from the classically Spanish to the emphatically international. Offers available for Half Board at La Terraza include a 4 Nights for 3 Offer – ask your Ascot Golf sales agent for further details. Restaurant and Bar Laurel at La Cala Golf Clubhouse offers both fine dining and casual fare. Enjoy superb views of the beautiful natural surroundings and La Cala golf courses, accompanied by music and a lively atmosphere. La Bodega Restaurant & Bar Savour the style and exciting flavour of a traditional Spanish wine cellar with Andalusian influence. With its blend of light, bright walls, warm tiled floors, La Bodega at La Cala Resort, is the perfect setting for a light meal, a feast or a culinary adventure. Bar Limonada Situated right by the hotel pool, Bar Limonada is the ideal spot to sip at a long, cool drink while La Cala’s friendly climate works its magic! Open May-September. Bar Naranjo is two venues in one: inside at the lobby, it’s a cool and comfortable place to take a break from sunbathing while you contemplate the day and the pleasure of good company! Outside on the Andalusian patio, it’s a sun-drenched idyll, shaded by tall palms, orange trees with seats and tables grouped around the fountain. Enjoy an aperitif or healthy drink accompanied by tapas or tease your palate with a refreshing beer or cocktail. Also at La Cala for guests, is Podio Recreation Room, a private place to watch your favourite sport, read or simply enjoy the company of friends. Guests of La Cala Resort enjoy use of La Cala Spa, with 18m² lap pool and thermal circuit facilities. La Cala features a squash court, two tennis courts, two running circuits, a professional football pitch and a Resort team of Wellness experts running fresco activities such as Yoga, Pilates, Zumba and Aqua Aerobics. As La Cala is so close to the Mediterranean Sea, water skiing, sailing, kite surfing, scuba diving can all be arranged through Hotel Concierge. 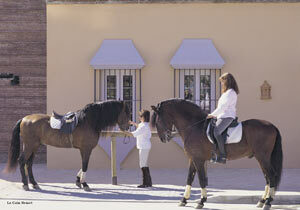 For mountain-lifestyle, horse riding, mountain biking and trekking along the stunning Sierra de Mijas nature trails. In addition, a range of lifestyle daily classes range from Tai Chi to Aqua Aerobics… It´s all right here at La Cala! The towns of Fuengirola (10km) and Marbella & Puerto Banus (30km) are within easy driving distance for nights out and/or evening meals. 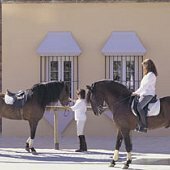 The El Jinete stables at La Cala are available to all guests at the Resort with memorable treks through the Mijas hills are available lasting for 1 - 2 hours (€30 - €50). Play in the La Cala Spring Open Tournament at La Cala Resort April 2017. Entry includes 3 green fees on the 3 courses at La Cala (Asia, America and Europa). All golfers (ladies/men) with an official handicap are welcome to take part. Programmes for non-golfers are also available with Spa treatments. The tournament winner will be the player with the best individual Stableford score over 54-holes. In addition, there are handicap categories with prizes in each category. Tee times and tournament details are announced during the welcome cocktail party. For Tournament Entry, please include on your Ascot Golf Holiday Booking for La Cala that you wish to participate in the 2017 Spring Open. Play in the 14th World Open Tournament at La Cala Resort this November. Entry includes 4 green fees (1 practice and 3 competitive) on the 3 courses at La Cala (Asia, America and Europa). For Tournament Entry, please include on your Ascot Golf Holiday Booking for La Cala that you wish to participate in the World Open. La Cala Golf Academy is situated adjacent to a six-hole Par-3 course at La Cala – providing a perfect facility for beginner and experienced players alike to develop their golf games. La Cala Academy programmes cater for every standard of golfer – from beginner to amateur competitor to touring professional. One on One Coaching - The lesson includes extensive video and computer analysis. Your swing video will be emailed to you after the session to assist with your further game development. •Meet the instructor, set a goal for the lesson. •Prescribe corrective drills with video feedback to help you develop the right feel and improve technique. •Personal plan for on-going improvement. Playing Lessons – Designed to improve the tactical aspects of your game such as course management, club selection, shot selection and pre shot routine on each and every hole. •Green Fee for desired course. •Golf Course instruction for 9 or 18 holes. The two day golf program includes 4 hours (2 hours per day) of tuition taken over two days. This 6 hour tuition package taken over 3 days (2 hours per day) is ideal for beginners or high/mid handicap players. In addition to the tuition, a custom fitting experience is included in this program to ensure that you are using the best equipment for your game. •Meet the instructor, evaluate your skills; define an improvement plan to achieve the desired results. •V1 Video Analysis technology to identify the strengths and weaknesses of your game. •Instruction can include all aspects of the game such as full swing irons and woods, chipping, pitching, bunker and putting fundamentals. •Distance control, shots from difficult lies. This 10 hour tuition package taken over 5 days (2 hours per day) is ideal for mid-low handicap players. In addition to the tuition, a Final day 9 Holes will be played. The Evolution Package is a bumper pack of 10 lessons “One on One” with a PGA Golf Pro. Each lesson is an hour long and the package is tailor fitted to suit all golfers and all aspects of the game. The Half Day Programme consists of 3 hrs spent at the academy range developing key areas of your game. This package is tailored to the goal of the golfer. Similar to the Half day package, the full day package is also spent at the academy for 3 hrs in the day. However the second half of the package is based on-course. Course tuition is the schedule for the afternoon in this package, where the PGA Pro accompanies you around the course working on skills such as course maintenance and strategy to reduce mistakes and improve scores! La Cala Spa at La Cala Resort provides a beautiful haven of relaxation with floors paved with mosaics and marble, and walls gilded with stucco works. La Cala Spa’s skilled team of professionals administer a wide range of treatments from facials to massages and reflexology. The spa features two premier international skin-care brands, Décleor and Ytsara, satisfying the discerning and wide-ranging needs and preferences of male and female guests. Please ask your Ascot Golf Sales Agent for further details, or to ensure availability at La Cala Spa please include your spa preferences with your Ascot Golf holiday booking. 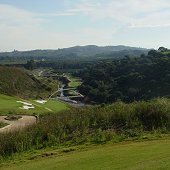 Accuracy is most important on the La Cala Asia (formerly South Course), with deep rough and slopes surrounding many fairways and green. Length is not as much of a factor, making the course suitable and a most enjoyable test for all players. The La Cala America (formerly North Course) is the most challenging of the 3 courses at La Cala for both length and terrain. With deep bunkers guarding most greens, water features are a factor on just two holes, which encourages strong play. 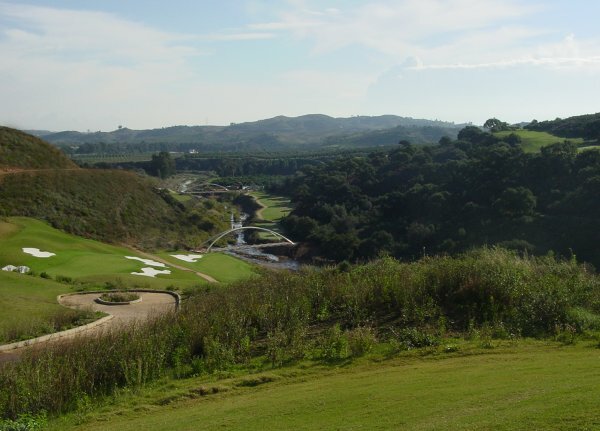 The course features spectacular mountain and coastal views, towards the end of the 18 holes in particular. The third Course at La Cala - Europa - was opened in March 2005. With generous sloping fairways, and attractively contoured greens, the Europa is immediately pleasing on the eye. Bunkers and the Ojen river present the main hazards in the absence of heavy rough. The 14th is a testing par 3 at 233 metres off the back tees, with the 11th also requiring some hitting - a par 5 measuring 524 metres from the back tees. A spectacular parkland course, and rated as one of the very best on the Costa del Sol, Santana is a demanding challenge to look forward to again and again. Water plays an important role during the round, although not dominating the overall design. Buggy paths are beautifully integrated between the rows of trees which include avocado, eucalyptus, orange, lemon, cactus, pines, fig, cork, olive and mango. A spectacular parkland course, and rated as one of the very best on the Costa del Sol, Santana is a demanding challenge to look forward to again and again. Buggy paths are beautifully integrated between the rows of trees which include avocado, eucalyptus, orange, lemon, cactus, pines, fig, cork, olive and mango. Spectacular views of the Mijas Mountains add to the beauty of this Cabell Robinson layout. Torrequebrada Golf Course is ideally situated between the Mediterranean and the Mijas Mountains, overlooked by the First Flatotel Apartments at Benalmadena. The attractive layout features tree-lined fairways with mature tropical vegetation and a number of lakes. The 11th is the signature hole - a 164-metre par-three with water at the front of the green, bunkers surrounding it and a two-tier green! The course includes several dog-legs and accuracy off the tee takes priority over power! Torrequebrada is a previous host of the Spanish Open and the home base of Spanish Ryder Cup star Miguel Angel Jimenez.